Postcard NL-2061870 from the Netherlands shows a vintage poster of the "new" Contax II-A and III-A cameras. Contax was a camera brand noted for its unique technical innovation and a wide range of Zeiss lenses, known for their high optical quality. 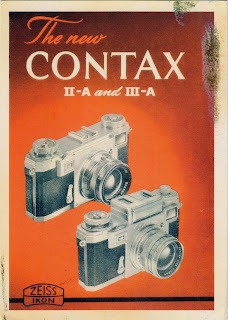 The Contax II and III models were introduced in 1936. The only difference between II and III was that the model III has a built-in exposure meter. Among the many features the both models introduced are the combined eyepiece for both viewfinder and rangefinder; top placement of the shutter speed dial and film wind knob; fastest shutter speed at the time at 1/1250 s. and chrome plating finish. They became highly sought-after among professional photographers, similar to today's iPhone in some way. However, in the background of the rapid digital revolution in the 2000s, film cameras were rapidly replaced by digital cameras. The production of Contax cameras ceased in 2005, two years before the first iPhone was released.